This afternoon, the Geospatial Data Act (GDA) was introduced in the Senate by Senators Hatch (R-UT), Warner (D-VA), Heller (R-NV), Wyden (OR), Boozman (R-AR) and Klobuchar (D-MN) as S.2128 and in the House by Representatives Westerman (R-AR) and Moulton (D-MA) as H.R.4395. NSGIC has supported the GDA in a few different forms, it having been introduced in a previous Congress, as well as having undergone revisions since its last introduction. It has retained its critical core – developing a national spatial data infrastructure (NSDI) that will significantly improve government services for citizens across the country. Working with partner organizations, we delivered a GDA support letter that included other well-respected national organizations and geospatial technology and services companies. It is the strongest showing of support for the GDA that has ever been garnered. 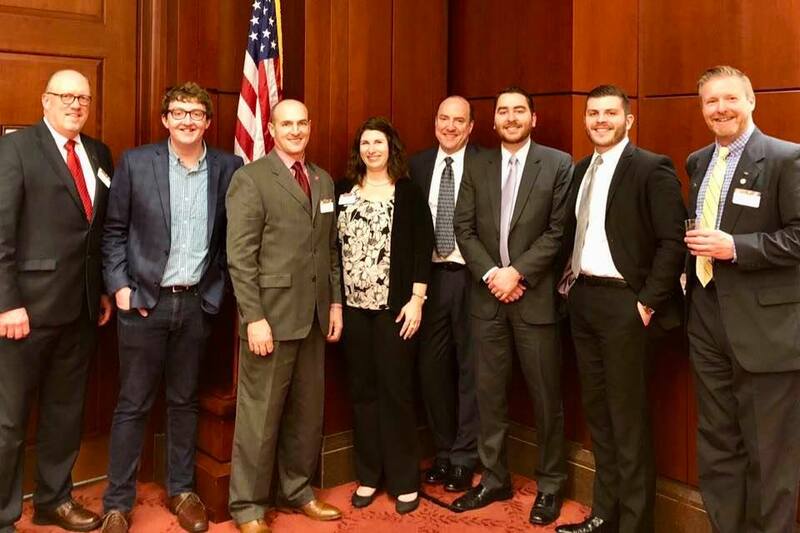 I had the opportunity to join a few NSGIC colleagues – Cy Smith (OR), Shelby Johnson (AR), Dan Ross (MN) and our executive director, Molly Schar – for a Capitol Hill GIS Day reception we co-hosted with AAG and Esri. It was an excellent opportunity to speak with lawmakers and their staff members about why the GDA is so important, and it also gave us a chance to talk with the other nonprofit and corporate representatives in the room who are our partners in supporting this legislation. With transparent and coordinated advocacy efforts, we can leverage the momentum building in the geospatial community for this bipartisan, “good government” bill. As I said in my remarks during the reception this afternoon, developing a national spatial data infrastructure is a concept that we have struggled with for the past 24 years – since the signing of Executive Order 12906 in 1993. The NSDI, as a concept, has mostly been an federal interagency pursuit, with little comparatively little consideration to harnessing the significant geospatial capabilities that state, tribe, regional or local governments, and the commercial sector have developed in the past two decades. The GDA codifies a strong multi-sector governance structure for NSDI strategy and activities, and it mandates Congressional oversight of federal geospatial expenditures. There are two specific provisions of this bill that NSGIC believes will be difference makers toward the achievement of a fully functional, and truly 'national' spatial data infrastructure. The first of those provisions is the authorization of the National Geospatial Advisory Committee (NGAC). This committee serves now as the best alternative we have to a collaborative governance structure for the NSDI. To be a truly national, shared spatial data infrastructure, the NSDI must be built and maintained by multiple levels of government, academia, non-profits and the private sector. No single entity has authority over all of those participants. There must be a collaborative governance structure that provides the ability for all the partners to make decisions and develop direction together that everyone will agree to follow. The NGAC isn’t perfect, but with its authorization in statute, we are closer to such a collaborative governance model. The second of those provisions in the bill is the direction to federal agencies to develop and use partnerships with state, local and tribal governments, academia, and the private sector to develop and maintain the NSDI. Based on the importance of collaboration to the NSDI, this provision is extremely important and has mostly been elusive over the past quarter century. For me, this has been a GIS Day to remember. Not only have I had the opportunity to spend it with NSGIC colleagues, but I’ve spent it with more than 60 stakeholders and supporters who share the goal of developing a robust NSDI. Together, we can do that.